Starting your Instagram branding from scratch can seem like a tall order task. Far too often we see brands on Instagram turn their channels into graveyards. Typically you see about 15 photos, 150 followers and zero updates in the last couple of months. If you’re reading this and know you fall into this category–that’s fine–we’re here to help. Integrating Instagram into your marketing and branding strategy is essential for any business trying to grow their audience. But Instagram branding isn’t an easy task. Gaining the trust, engagement and attention of Instagram users is no a walk in the park either. In fact, eMarketer discovered less than 50% of brands are actively on Instagram. While the agency expects that number to increase to roughly 71% by 2017, there’s still a lot businesses can learn about the social network. With a half-a-billion active users on Instagram, there are massive opportunities to get seen. Pew Research found 35% of Instagram users visited the network multiple times a day in 2015. And nearly 60% of Instagram users admit to checking their feed at least once a day. Think about how much you’d pay (or have paid) for advertising promising the same amount of viewership? While you’re likely not going to see 60% of Instagram users on your account, you have the chance to tap into this audience and build a name for your brand on the space. When you successfully craft your Instagram branding strategy, you gain a large amount of trust from your followers. Additional data from eMarketer showed 35% of social media users trust brands and are influenced by retailers. While that number might seem low, influencing one-third of your social media followers through channels like Instagram can have serious payoffs. Instagram is the perfect place to showcase your branding, creativeness and visual aspect of your product or service. With captivating images and videos, you show the true beauty in your products. Even businesses that don’t necessarily consider themselves “visually appealing” can provide insights into their trade. For example, the packaging and tape manufacturer 3M does a fantastic job creating interesting visuals. This goes against the grain that “boring content” comes from “boring industries.” Instead, 3M posts content daily and receives approximately 200 engagements (such as likes, comments, views or shares) for each post. Even though Instagram still only permits one link in your bio, that bridge to your site can mean everything. Your bio link should be updated regularly, especially if you want to drive users to specific landing pages. As for your content, setting up well-planned and thought-out call-to-action phrases in your Instagram captions can make all the difference. Use actionable voices that don’t seem to salesy or over the top. With some of Instagram’s newest features, you now have the opportunity to check link clicks in the native platform. 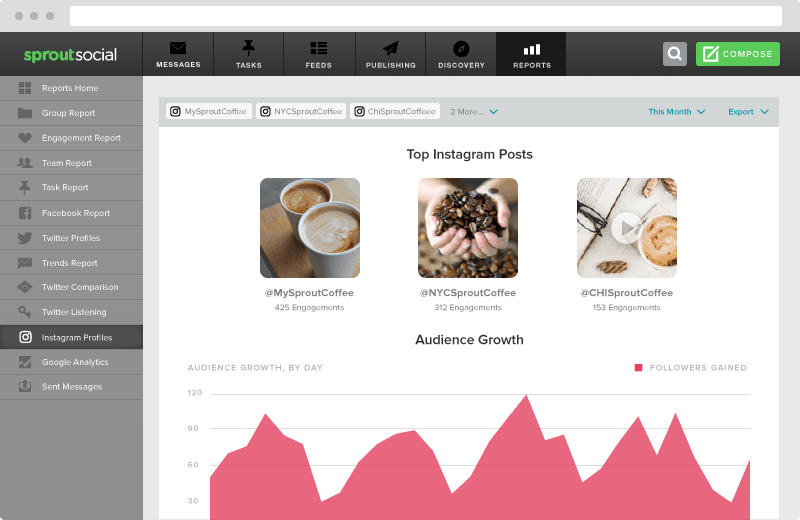 However, there’s no way to track, collaborate or view all of your Instagram metrics in one place. This is why so many people trust Sprout Social as their go-to Instagram management tool. With Sprout you can easily view your overall Instagram engagement, hashtags mentioned with your name or trending hashtags in your industry. Also, managing comments makes life easier for marketers and social media managers wanting to take their engagement even further. We’ll discuss the benefits of engagement on Instagram further down, but first let’s take a look at how Instagram branding can work for you. According to a study performed by four Italian computer analysts, data showed approximately 8% of Instagram accounts act like spam bots. Additionally, after pulling data on more than 10.2 million Instagram accounts, roughly 30% were completely inactive or posted only once a day. This means the rise in fake Instagrammers can harm the value of your marketing efforts when building an engaged audience. I’m looking at you, Instafollower_86. However, don’t let these in-active, spammy bots deter you from building a real audience. You simply have to focus on getting real followers that are interested in your product or who are already customers. Don’t add followers just to have them, instead try to build relationships with users by acknowledging them in comments, posting user-generated content or responding to real questions. With followers who comment, share and like, you have a valuable source of social media ROI. On the other hand, a brand account with 100,000 users and no interaction screams you got your followers unethically. This can be deceiving and ultimately hurt your brand. Don’t risk it. Build your followers slowly and steadily. Try to post once and interact with at least 3 users a day. 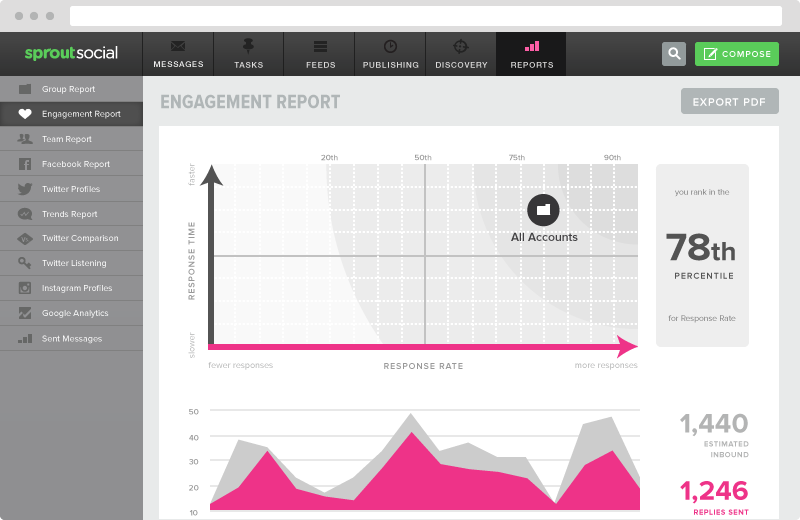 This will build loyalty, brand awareness and show other users you respond and care about customers. While this might sound demanding, using Sprout Social’s Instagram management tools can easily help social teams respond to customers, track conversations and collaborate on engagement. Beautiful, eye-catching content works on Instagram. This social network is all about visuals and using blank images with quotes will only take you so far. As a brand, you have the chance to truly engage with users. In fact, a Forrester report stated engagement with brands on Instagram is 10 times higher than Facebook and 84 times more than Twitter. Light is your best friend: One of the most challenging parts of photography is lighting. For your Instagram, try to add as much natural light as possible. Don’t use overhead lights because it creates shadows. Light from the side and add plenty of it. Bright images tend to “pop” and ultimately get more engagement. Put your subject in the center: Your eyes always tend to gravitate to the point of interest in the middle. Make sure you focus your product or model in the center to take better photos. This helps structure the foreground and lead eyes toward the subject. Think of how it will look on Instagram: Beautiful images use up all the space on a photo. However, you have to think of how images will look on Instagram and in others’ feeds. Work with your “square” and try to implement the rule of threes to make use of your image shape. Simply divide your image into nine smaller squares to see how each section makes up the entire image. Find truly bold colors and defined shapes: This might seem easier said than done, but try to find colors that truly stand out. Bright blues, encapsulating reds, and enticing yellows will make you stand out among the rest. Additionally, look for unique shapes and standout lines to actually shape your image. These three things can make all the difference. Get photo editing tools: If you can’t hire a design team to edit photos, try third party apps like Afterlight, VSCO and even Instagram’s native platform to make edits. Remember to not go too overboard with filters or editing settings. You’re trying to engage–not win first prize in a photography contest. Now that we see how beautiful content engages users, you need to post images and videos that your audience actually likes. 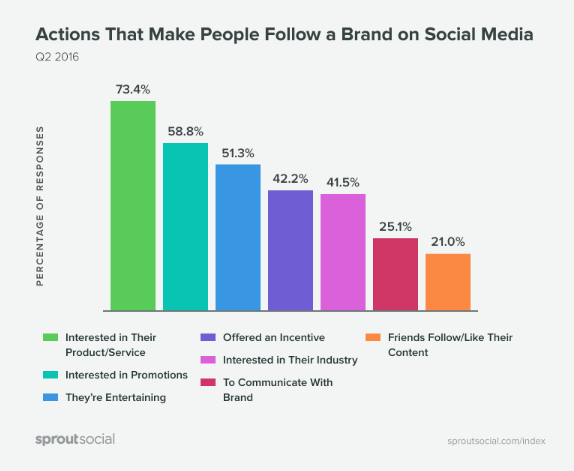 According to the Q3 Sprout Social Index, 86% of users want to (and actually do) follow brands on social media. As for your Instagram audience, they’re there to gain insights on products or services, get deals, or at the very least, be entertained by your visual content. This is why brands have to post content that caters to what their audience wants. But how do you find out what they’re into? One of the fastest ways to get insights is to simply ask questions. Ask what kind of content your followers want and they’ll more than likely tell you. If you don’t want to ask, try using social media analytics tools to track engagement over each post. You can gain a ton of insights into social media content performance and see what your audience engages with more per post. For example, Champion drives more engagement because they know people like their vintage- and retro-style content. In fact, you can clearly see that when they post this type of content, it gains more traction and engagement. As you start your Instagram branding, dive deep into what your users want, and give it to them. Increasing your visibility through Instagram branding needs a bit of creativity. This is why it’s critical to create your own style on the platform so people recognize you. If you look at any major Instagram brand account, you’ll notice something right away–there’s a clear concept or characteristic you can find right away. 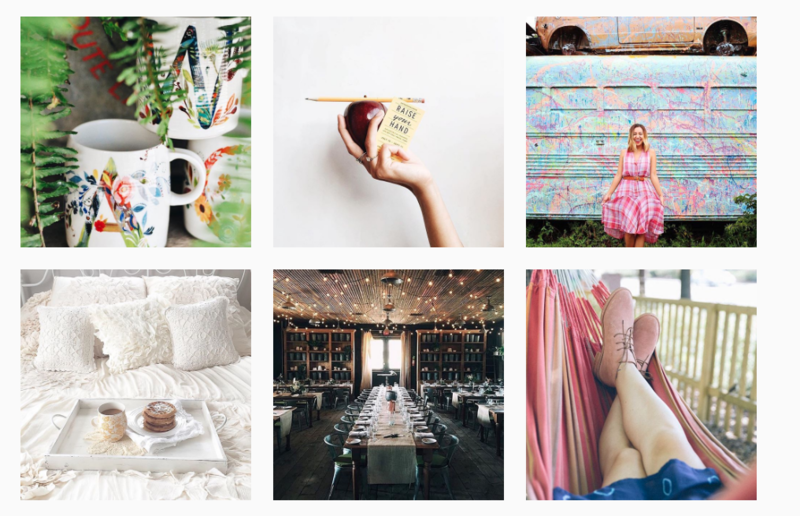 For example, the apparel and home goods store Anthropologie has its own style on Instagram. The images all heavily rely on natural light. Even the dark image of the banquet hall uses natural light to draw attention. It’s not a coincidence it has the most engagement of any photo above. 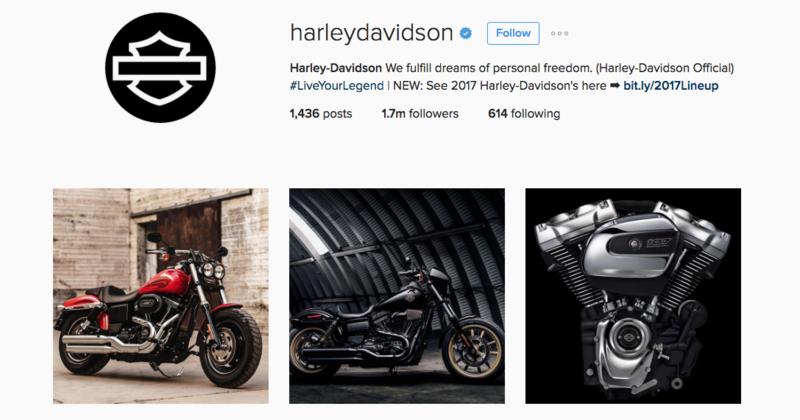 Another great brand on Instagram is Harley-Davidson. The iconic motorcycle company uses several wood, metal and other earthy tones. This draws attention to the engine and the mechanical characteristics of their bikes. Lastly, Taco Bell has made a name for itself in the marketing world due to its strong social presence. 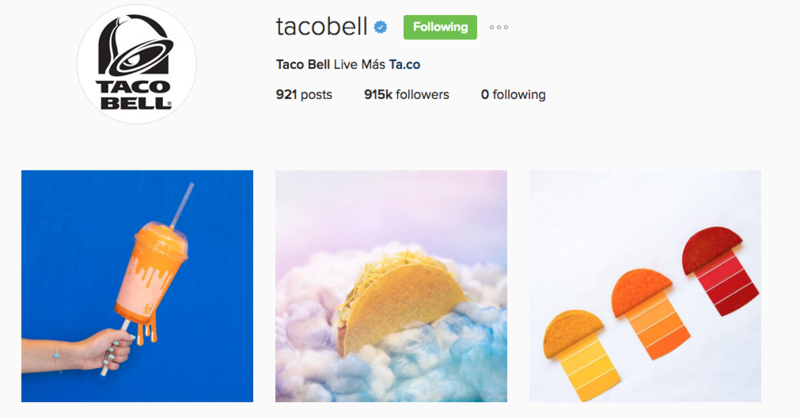 Taco Bell’s bright and vibrant colors often brand itself to younger consumers. Instagram is just one network where you’ll see this brand shine. Before you start your Instagram branding strategy, look at some competitors in your industry and see how they fair on the network. Try to find your own style that speaks to your brand and audience. But remember originality is key, so just use other accounts for brainstorming. Hashtags make your brand searchable to build a bigger audience. And on Instagram, hashtags get people talking about your brand as you market your product or service. According to Simply Measured, of the most popular hashtags on Instagram, 70% are branded. Most brands use about two hashtags per post and some are as simple as the brand name itself. For example, the burger chain Shake Shack uses #shakeshack in numerous posts on Instagram. Through these hashtags, the company promotes their brand and gains massive audience participation. Even though Shake Shack has only 303,000 followers, the hashtag #shakeshack is included in almost 500,000 posts. This is why it’s smart to start a hashtag campaign. Whether you’re simply trying to get more people familiar with your brand name or you’re running a campaign, hashtags help. Hashtags are a great way to get people involved with your business. And it’s one of the best ways to build your Instagram brand from scratch. Need help tracking these hashtags? Try using Sprout Social’s Instagram analytics tools and reports to see what hashtags are being used the most across the platform. Instagram’s biggest age range is 18 to 29 year olds. On top of that, this age group is typically the most cynical and hesitant to brands on social media. According to research from Initiative, 30% of millennials in the US (40% in UK) are hesitant or skeptical of the way marketers brand to them. This means the majority of users can smell crummy used-car salesmen marketing tactics a mile away. Don’t try to pull a fast one on your biggest audience. Instead, try to speak with honest, open and frank captions. The more you try to sell, the likelier you’ll push away buyers. As we mentioned earlier, great images or videos allow users to decide on your product or service themselves. But a great Instagram caption can push users to learn more. Don’t skip your captions because with the new Instagram algorithm, getting seen is a bit harder. On the other hand, your captions should get to the point and have the most important details toward the front. Just because you have 2,220 characters to use, doesn’t mean you should use all or even a fraction of that. Practice brevity and use great calls to action that get to the point and drive users to read more. Pro Tip: Spark users’ interests with content you know works. Look at your most successful and engaged posts and then think of the language that drives that content. There’s a reason those posts work. Pique users’ curiosity with well-written and straight-to-the-point text. For many marketers, Instagram is likely your second or third social media channel to tackle. If you’ve already built a nice-sized audience on another channel, use it to promote your Instagram. It’s hard to find ads these days that don’t include at least a business Twitter handle or Facebook link. Instagram is getting more popular to share across networks because it can break up the style of content you typically push on Facebook, Twitter or LinkedIn. Use your other social media channels to cross promote and build your Instagram brand. Even though some naysayers believe cross promoting your social channels hurts traffic, there’s a lot more benefits than negatives. In fact, cross promoting your accounts helps you drive customers further down the funnel. By cross promoting, you provide a social media outlet for whichever one your audience likes the most. Not only does cross promotion funnel customers, it provides you with different sources to market content. As we’ve discussed, there are several benefits to Instagram branding, but some will argue having one link in the bio makes it hard to funnel customers further. That’s why it’s great to cross promote your Twitter, Facebook and LinkedIn to build bigger audiences and ultimately give customers a choice on where to view your content. 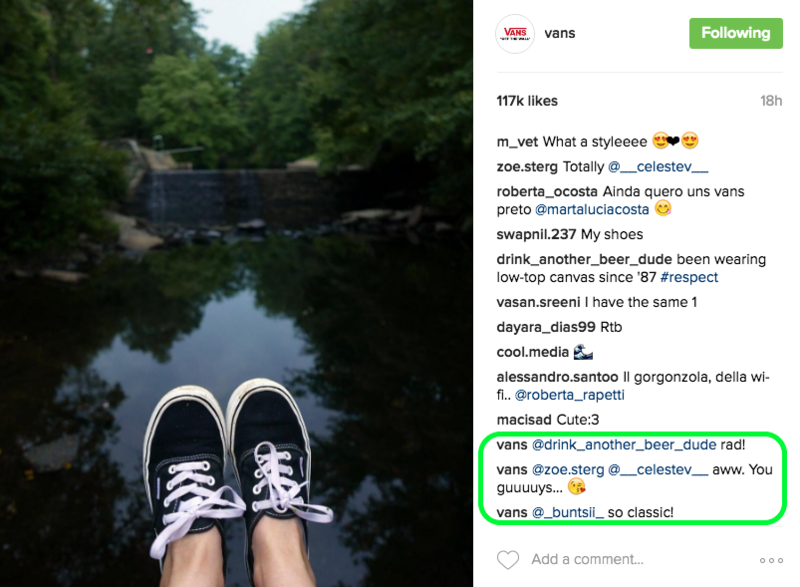 User-generated content on Instagram is big business for brands. A Bazaarvoice study on UGC and millennials discovered 84% of the age group are at least somewhat influenced by this type of content while making a purchasing decision. It’s important to be cautious with UGC. You want to ask users before using their content on your site to avoid any legal trouble. Secondly, account takeovers can actually drive your audience away if you’re not cautious about who’s posting (and how much) on your feed. As you begin your Instagram branding process, try to think of ways that can get more people to your site. Just remember to avoid irrelevant contests that award random prizes. You don’t want to seem needy for followers. Instead, build trust by sharing posts, joining conversation and all-around engaging. Brands put a lot of emphasis on cohesive advertising. You don’t want to market to the wrong demographic or seem inconsistent with other advertisements. The same sentiment applies to social media as well. On Instagram, your brand should be cohesive across all posts. If you use any text or logos on your images and videos, make sure it meets your own brand guidelines. Don’t discredit your brand guidelines on Instagram and make sure your colors, fonts and overall aesthetic match everything else in your company branding. 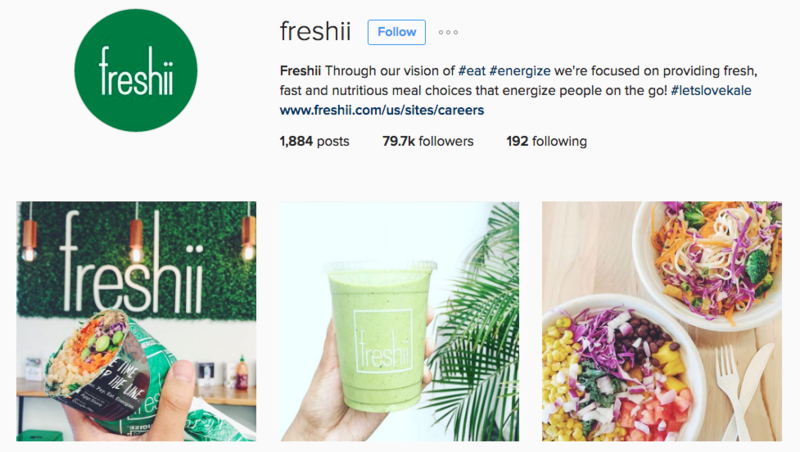 Freshii’s Instagram consistently pushes the idea of “green” eating. It’s relative across nearly all their posts. Themes like this truly work to build an aesthetic for your Instagram branding. When you’re getting started on Instagram, don’t rush or hurry your posts. Make sure you have others approve your content so everyone agrees it’s on brand and coherent. Being off brand in the beginning could really slow down your Instagram branding strategy. While it might seem like too much work, finding the right balance of content could push you from 10,000 to 100,000 followers. Instagram trends are constantly changing, which means you have to be ready to see if the “new” thing works for your brand. 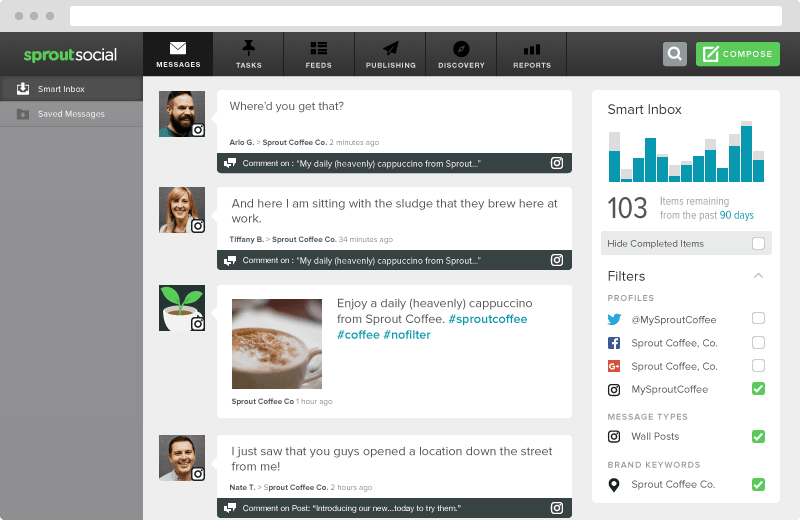 By using Sprout Social, you can track audience engagement, hashtags and comments that revolve around your Instagram. Find out what works best and continue to shape your brand on Instagram. We can’t recommend this enough, but monitoring your Instagram can set your brand apart on the social network. Responding to customer comments, questions or concerns shows your audience you’re human and helpful. In fact, the 2016 Q2 Sprout Social Index discovered almost 35% of customers prefer to reach out to brands via social media. This beats out 1-800 numbers, email and the dreaded customer service phone calls. Take advantage of Sprout Social’s Instagram tracking and monitoring tools to manage multiple accounts in a single inbox. See where your customers are tagging and track conversations for future discussions or concerns. The conversation is moving more toward social media each day. With the rise of Instagram, make sure your brand is there and ready to communicate. Your payoff could be tremendous by following a few simple Instagram branding tips. Have any recommendations? Feel free to comment below!